Go behind the scenes of this National Historic Landmark, built by Dankmar Adler and Louis Sullivan, and view it as few do in this one hour tour. Enjoy the radiant 24-karat gold-leafed ceiling arches, hundreds of beautifully restored intricate stencil patterns, ornate gilded and bas-relief designs, and the endless floor and wall mosaics and murals. Explore the theatre that has hosted thousands of artists in its 126 year old history – from the Ziegfeld Follies to The Joffrey Ballet, from Queen to Prince, from the Grateful Dead to Alvin Ailey, from Show Boat to Miss Saigon, and so much more! 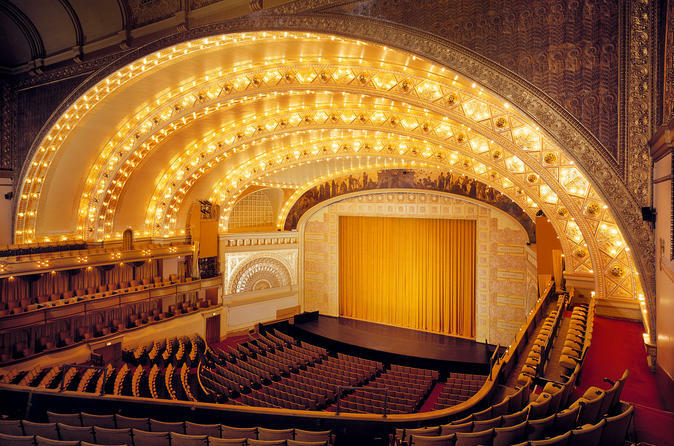 A National Historic Landmark, the Auditorium Theatre is known internationally for its perfect acoustics, innovative architecture, and stunning design. Located in Chicago's Loop, join us in our box office lobby at 50 E Congress Parkway to journey inside the theatre and learn about the history, architecture, and art hidden within. The famous architectural firm of Adler and Sullivan designed this 4,000 seat theatre in 1889 using modern technology, including electric lighting and air conditioning. They pushed the limits of modern architecture to make the Auditorium the tallest building in Chicago, the first multi-use building ever designed and the most massive modern edifice in the world for its time. The Auditorium Theatre has a past that follows the path of Chicago’s history from the Great Chicago Fire and World’s Columbian Exposition of 1893 to the present. From opera to rock ‘n roll, from political conventions to sporting events, the Auditorium Theatre has played a role in the lives of Chicago citizens for 128 years.